Kevin was born and raised in Fullerton, CA and grew up worshiping with Brea Church of Christ in Brea, CA. He was baptized there on March 13, 2005. He attended Florida College in Temple Terrace, FL where he obtained his Bachelor’s of Arts in Biblical Studies with a minor in History. 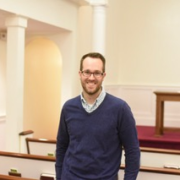 While attending Florida College, Kevin began his preaching career by serving as in intern with congregations in Kentucky, Florida, and Indiana. Since graduating college, Kevin has worked as a full time evangelist with congregations in Indiana, Nevada, California, and now Alabama. He has been with Marion Street Church of Christ since May 1, 2014. Kevin is married to Brooke Harrington (formerly Brooke Wilson) and together they have three sons Landon, Eli and Wilson. If you would like to contact Kevin, or if you would like a Bible study, please feel free to contact him by clicking on the “Contact Us” tab at the top of the page. You can send Kevin a private message with any questions or concerns you might have.